The predecessor of National Technical Committee 120 on Color of Standardization Administration of China is the sub-technical committee of National Technical Committee 7 on Ergonomics of Standardization Administration of China. With the rapid development of color science and technology and the pressing needs of our country's economic and social development towards color standardization, National Technical Committee 120 on Color of Standardization Administration of China was approved by State Bureau of Technical Supervision in 1989. Daheng Wang , the academician of Chinese Academy of Sciences, acted as the chairman. The responsible company of the secretariat is Shenzhen OCEANPOWER Technology Co., Ltd.and the Secretary-General is Xiuru Sun . 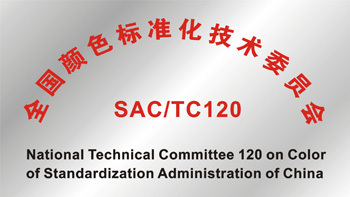 SAC/TC120 is under the direct leadership of SAC, takes charge of the management work of standardization of products in the color field , tables proposals about color standardization to SAC and deals with the work of standards establishment , amendment and revision. Since the establishment of SAC/TC120, it has established and revised many basic Chinese standards :some mandatory national standards such as national flag and national emblem ; some basic national standards such as Chinese Color System(CCS); important method standards such as Methods of Color Specification and some national standards of color products . Up to now, it has finished establishing 34 national standards. Color standard system has taken initial shape and SAC/TC120 has made a great contribution to the Color Standardization of China . With the rapid development of social economy and the improvement of living standard, in industry and agriculture and people's life, specification and classification of colors, management and control of colors , measurement and color schemes , color psychology and color physiology have been more widely used; technical requirements have been more and more refined and standardized. SAC/TC120 will carry out color standardization work more actively, make every effort to finish all the tasks from SAC, make a good job of national standard establishment and centralized management, promote the spirit of practicality, truth-seeking and courage in innovation and make a great contribution to accelerating the development of Chinese color science and color standardization. Water and environment is the eternal topic which human cares about, people need clean and fresh environment and water. However, due to the development of industrialization and urbanization, a large amount of industrial waste water and domestic sewage is produced, which greatly affects people's lives and health. There are a variety of methods for disinfection in water treatment technology, such as ultraviolet disinfection, chlorine disinfection, chlorine dioxide disinfection, ozone disinfection. Most of all, the ultraviolet disinfection technology has a strong broad-spectrum, high efficiency, low operating costs, no disinfection byproducts and many other outstanding advantages, is a physical environment-friendly disinfection method which is emerging recently in the international market. In order to give full play to the production、use、research and development、teaching ,lots of the experts in the field of national UV disinfection are carrying out the standardization of UV disinfection equipment. National Technical Committee 299 on Ultraviolet Disinfection of Standardization Administration of China is set up through approval of Standardization Administration of China, with No. SAC / TC 299, English name is the National Technical Committee 299 on Ultraviolet Disinfection of Standardization Administration of China. National Technical Committee 299 on Ultraviolet Disinfection of Standardization Administration of China is composed of 2 consultants and 27 members, Liu Yuanzhang and Long Zhizheng are consultants, Liu Wenjun is the chairman, Huang Yongheng is the Secretary General, the responsible company of the secretariat is Shenzhen OCEANPOWER Technology Co., Ltd..
National Technical Committee 299 on Ultraviolet Disinfection of Standardization Administration of China is mainly responsible for the standardization of UV disinfection equipment, including UV disinfection equipments, UV disinfection for sewage treatment, UV disinfection equipments for drinking water, UV disinfection equipments for air. In order to fully display the ability of the experts in the fields of producing, using, researching and teaching in the industry of environmental water treatment equipment, and better carry out the standardization work of environmental water treatment equipment , Subcommittee 2 on Water Treatment Equipment of National Technical Committee 275 on Environmental Protection Product of Standardization Administration of China was approved by Standardization Administration of China. Its identification number is SAC/TC275/SC2. Subcommittee 2 on Water Treatment Equipment of National Technical Committee 275 on Environmental Protection Product of Standardization Administration of China is composed of 4 consultants and 31 committee members. Yongheng Huang is the secretary-general and the responsible company of the secretariat is Shenzhen OCEANPOWER Technology Co., Ltd.
Subcommittee 2 on Water Treatment Equipment of National Technical Committee 275 on Environmental Protection Product of Standardization Administration of China has direct responsibility for the producing, designing , manufacturing ,testing , inspection ,selection, installation , maintenance, operating and the evaluation of environmental influence and social benefits towards water supply equipment, sewage treatment equipment, reclaimed water reuse equipment and integration of sewage treatment equipment. It also takes part in the national standard establishment about water treatment, water-saving and wastewater treatment. 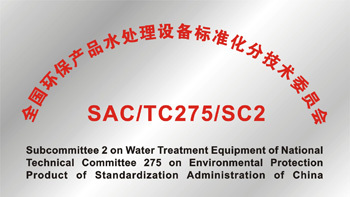 TC275/SC2 is associated with the international organization for standardization -----ISO/TC224 Service activities relating to drinking water supply systems and wastewater systems - Quality criteria of the service and performance indicators. 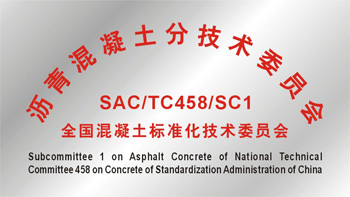 National Concrete Standardization Technical Committee of asphalt concrete technology Committee was approved by SAC on June 15, 2011and it is composed of 43 members. The chairwoman is Qisen Zhang, the vice-chairmen are Faguang Leng, Zhongying Guo, Mingren Li; committee member, Shiguo Xu, serves concurrently as the secretary general; committee members, Peiwen Hao and Tianqing Ling serve concurrently as the vice secretary generals. The responsible company of the secretariat is Shenzhen OCEANPOWER Technology Co., Ltd..
"Asphalt concrete of the National Concrete Technical Committee of Standardization Technical Committee of the Inauguration of the first work conference" was held in Beijing on October 27,2011. The leaders of Standardization Administration of China and the Industry and Commerce Bureau of Shenzhen , the representatives of the responsible company of the secretariat, Shenzhen OCEANPOWER Technology Co., Ltd. and other honored guests , media representative ,committee members and relevant experts attended the meeting and announced the establishment . SAC/TC458/SC1 mainly takes charge of the establishment and revision of national standard in the field of asphalt concrete. Key emphasis in work is : standardization in the field of environmental, low-carbon asphalt concrete; standardization of asphalt concrete’s quality ; standardization of relevant products. The detailed scope of SAC/TC458/SC1's work is : raw material, asphalt concrete type, mix proportion of asphalt concrete type, performance test methods, witnessed inspections , construction, performance test equipment , related software , function materials, quality control, grade estimation, indoor maintenance and related instrument equipment , business administration of asphalt concrete. 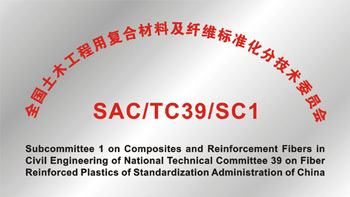 为 In order to fully display the relevant experts’s ability and take better part in standardization work, Subcommittee 1 on Composites and Reinforcement Fibers in Civil Engineering of National Technical Committee 39 on Fiber Reinforced Plastics of Standardization Administration of China was approved by SAC. Its identification number is SAC/TC39/SC1. Subcommittee 1 on Composites and Reinforcement Fibers in Civil Engineering of National Technical Committee 39 on Fiber Reinforced Plastics of Standardization Administration of China is composed of 1consultant and 24 committee members. The consultant is Zhitao Lv , the chairwoman is Danying Gao and the vice-chairmen are ZhongyongHu, Qisen Zhang, Zhisen Wu; committee member, Xinping Zhao, serves concurrently as the secretary general. committee members, Yimin Zhao and Yining Ding, serve concurrently as the vice secretary generals. The responsible company of the secretariat is Shenzhen OCEANPOWER Technology Co., Ltd..
SAC/TC118/WG11 is one of the 10 working groups under the leadership of National Technical Committee 118 on Standard Sample of Standardization Administration of China. It is set up through approval of TC118’s Document No. 15. SAC/TC118/WG11 is composed of 22 memebers related to color standard sample. Among them, the chairwoman is Xiuru Sun, the vice-chairmen are Zheng Wei, Xiaoxia Wan; committee member, Xiaoyu Pei , serves concurrently as the secretary general. The responsible company of the secretariat is Shenzhen OCEANPOWER Technology Co., Ltd.. 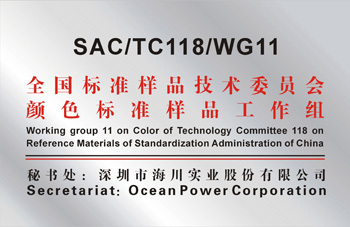 The main task of SAC/TC118/WG11:make a plan and proposal about color standard sample; Inspect and supervise the executing of the project plan; examine and submit color standard sample draw up by SAC/TC118/WG11; take charge of the regular connection and coordination with other committee and working groups ; make the decision about how to fully implement the resolution approved by SAC/TC118/WG11 ; organize the explaining, consultation, coordination and experience exchangement. Standard sample is an integral part of standard Operations . It is another existence form of standard . Standard sample and written standard form the complete system in order to ensure the consistency of standard in different time and place. Up to now, the color standard samples which have been issued are GSB16-2062-2006, GSB16-1517-2002 and GSB16-2767-2011. With the development of science and technology, the function of color’s measurement and control in production and quality assurance are paid more and more attention to . In order to ensure the color workers can describe and control color according to the same standard ,SAC/TC118/WG11 will develop and research color standard sample in a scientific, efficient and logical way . SAC/TC118/WG11 will coordinate all the different parties and make a great contribution to improving the scientific and application level in the field of color .